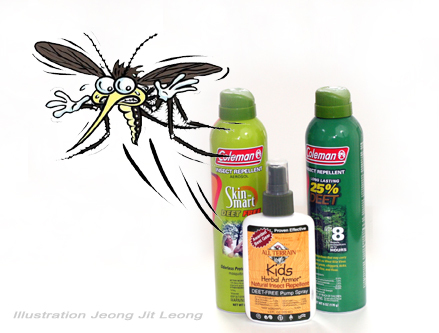 Mosquito Repellents: Natural Or DEET? As eager as we are to get outdoors this spring, we often cringe at the thought of getting bit by mosquitoes and ticks. Dealing with this problem is a constant battle and the dangers of West Nile Virus and Lime Disease is a real threat. While there are many repellents available, there’s some debate over the effectiveness of natural products, and the fear of using products with DEET. The fact is, both types of products work great, but you do need to be aware of how they react to your body and how to properly use them to be effective. DEET has been used for many years as an effective repellent. First developed and used by the U.S. Department of Agriculture for the military, it was patented by the U.S. Army in 1946, and became available to the general public in 1957. DEET’s chemical name is N,N-diethyl-3-methylbenzamide which has proven to be one of the best repellents available. Many tests have been done on DEET over the years, and the good news is that it’s not a cancer causing agent. It does however, absorb into the skin and blood stream, which causes concern for many people. Companies such as Coleman Repellants offer DEET and DEET free products that are effective for 8hours with one application. Various studies have shown that light doses of DEET are not harmful, which is key factor into the safety of its use. The Medical Sciences Bulletin, published by Pharmaceutical Information Associates Ltd, reports that studies indicate up to 56 percent of DEET applied topically, is absorbed into the skin. Of that amount, 17 percent is further absorbed into the bloodstream. For a weekend camping trip, applying a DEET repellent once a day may not pose any unhealthful risks. The danger however, may come from long term exposure. The Morbidity and Mortality Weekly Reportdated October 6, 1989, published an article called, “Epidemiologic Notes and Reports Seizures Temporally Associated with Use of DEET Insect Repellent – New York and Connecticut.” The article indicated that employees of the Everglades National Park reported episodes of confusion, headaches, irritability, and insomnia after repeated and prolonged use of DEET. Laboratory tests at Duke University Medical Center show that DEET causes brain cell death and behavioral changes in rats after frequent and prolonged use. This exposure causes neurogens to die in regions of the brain that control muscle movement, learning, memory and concentration. Their findings are consistent with reported human symptoms following DEET’s use by the military in the Persian Gulf War. Furthermore, to avoid over exposure, most product labels will not recommend applying DEET repellents under clothing, as it can be absorbed into the skin more rapidly. Young children shouldn’t be allowed to apply DEET products themselves as they can accidentally ingest it or apply too much product onto the skin. Pregnant women should also avoid using DEET products as medical research shows that it passes the the placenta wall. Natural Repellents Are Effective…But For How Long? One can argue that although DEET has been used since the 1940’s, natural remedies have been used for centuries. According to David Kulow, president of All Terrain, a manufacturer of herbal and natural products, the use of essential oils blocks the body’s natural scents, camouflaging the odors that attract insects. Natural mosquito repellents such as All Terrain use six essential oils in a time-release encapsulation to prolong its effectiveness. Testing has shown that by combining the right ingredients, natural remedies can be as effective as DEET. 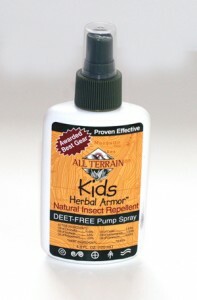 According to All Terrain’s independent lab results, the company’s natural repellents are as effective as products containing 5-7 percent DEET. While All Terrain prefers to use six repelling oils such as Citronella, Soybean, Peppermint, Cedar, Lemongrass, and Geranium to protect against mosquitoes, black flies, deerflies, ticks, gnats, and more, other manufacturers use lemon eucalyptus. The strong appeal towards non DEET products has also stirred companies to develop synthetic alternatives. 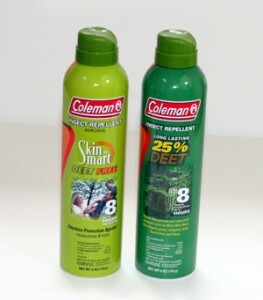 Coleman’s DEET free repellents use IR3535 a patented synthetic ingredient also known as 3-(N-Butyl-N-acetyl)-amino proprionic acid ethyl ester. Kermendy says that the product is very safe for use with children and provides odorless protection for up to eight hours. While many would still prefer natural ingredients, the problem with them is that they evaporate quickly. To reduce the frequency of applying natural oils to ward off mosquitoes, manufacturers like All Terrain developed a timed-released delivery system. “Essentially, the ingredients are encapsulated in beeswax, a sub-micron coating that varies in thicknesses and resembles a honeycomb,” says Kulow. “Body heat melts each layer of the coating to release the oils over a longer period of time.” Clinical tests of All Terrain’s Herbal Armor, the company’s most popular insect repellent, was conducted by the Department of Environmental Biology at the University of Guelph, located in Ontario Canada. The tests showed that the natural repellents were 100 percent effective for two hours, and were more than 85 percent effective for over 3.5 hours after application. This timed release method allows for fewer applications of a natural product and protects the application from water and perspiration. Another item to consider is how the product is applied. Aerosol products are commonly being discontinued due to its effects on the environment. Furthermore, aerosols often use an alcohol base which can dilute the effectiveness of the repellent. Lotions are one of the more popular methods to apply repellents as are spray bottles. In both of these types of delivery systems, 100 percent of the product is applied. So no matter what product you choose, the important fact is to carefully read the directions on the label and determine how often the product needs to be applied to maintain protection, and prevent over absorption of unwanted chemicals into your system. Contact a ranger or guide in the area that you plan to visit and find out if mosquitoes and ticks are about and determine how often you’ll be exposed to know how much protection you may need during your visit.